Well it must have been a grim scene in the PMO bunker this week. For years the Con propaganda machine has tried to brainwash Canadians into believing that Stephen Harper is a Great Economist Leader. The steady hand on the wheel, steering us to prosperity, the only leader who knows ANYTHING about economics. Even as he put all our economic eggs into one oily basket, decimated our manufacturing sector, flooded the country with foreign workers, drove down wages, and failed to come up with an industrial strategy, or create enough jobs. But that absurd myth has finally fallen apart, after the Great Helmsman’s boat collided with the hard rock of reality. The Harper government was slapped with grim reminders about the broad economic and political implications of low oil prices Tuesday as experts delivered a fresh round of dire warnings about the potential fallout. The bad news included a projection by one of the country’s biggest banks, which predicted the rapid fall in oil prices would transform the federal government’s long-promised 2015-16 surplus into a deficit. His oily gamble has failed catastrophically. 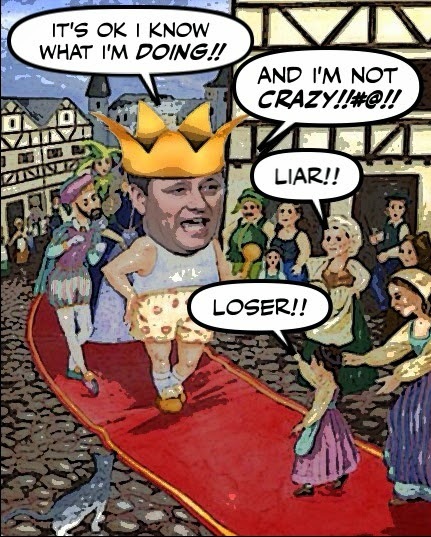 His tarry love affair with Greater Alberta is now threatening to drag the whole country down. As well as blowing a giant hole in his chances of winning the next election. Politically, the red flags threaten to complicate the Harper government’s efforts to present itself as a stable steward of a strong economy in the leadup to a federal election that’s currently scheduled for October. ‘While threats to the global economy loom — including falling oil prices — our Conservative government’s plan for the economy is working,’ he said in a statement. And must either think we are fools, or be suffering from dementia. 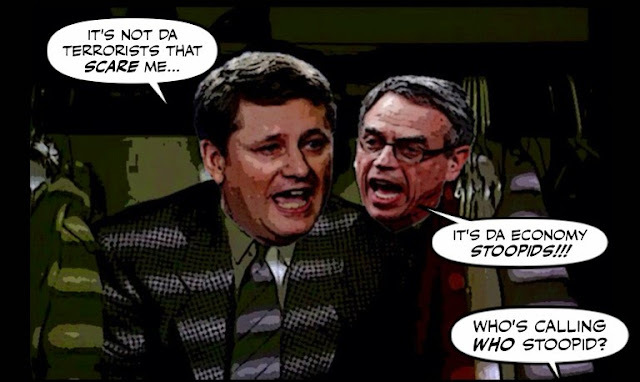 But of course Stephen Harper is now desperate, and probably quaking in his boots as much as he did when he hid in that closet. Because he MUST balance the budget, even if he has to fill his bribe bowl with the blood of jobs killed and services slashed to the bone. 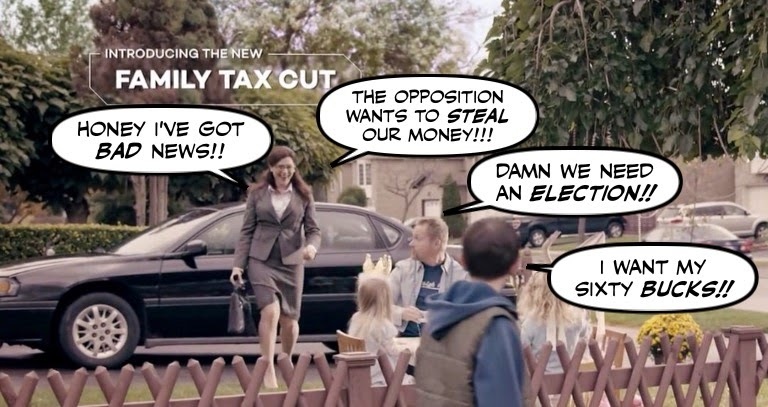 And he will try to buy the next election, as this ad released last night by the Con propaganda machine makes only too clear … Because now it’s come down to this: he may have led us to economic disaster, but he will pay Canadians to vote for him. And the question is does that mean, as John Ivison suggests, an early election? Certainly, the temptation to break the October fixed election date must be nearly irresistible. Stephen Harper’s pitch to Canadians is that he is best positioned to provide them with physical and economic security, at a time when threats to both are on the rise. But it is the tumbling oil price, along with the economic uncertainty it heralds, that has persuaded me that the Great Opportunist will risk the charge of rank hypocrisy and break his own election law again. Before things get even worse. The stock market tanks, or the housing market implodes. And the good news is that it doesn’t really matter when that election is called, as long as we are ready. Because the myth that has sustained him for so long has finally been shattered. He was no economist. He’s walking around in his underwear. He’s never been more vulnerable. Meanwhile, in a recent post I said that I wasn’t sure whether Oily Joe Oliver knew what he was doing. But it turns out the situation is even worse than I thought. One moment he’s claiming we have nothing to worry about. Finance Minister Joe Oliver says the government is confident it can balance the next federal budget without scaling back on new tax measures and still turn up a small surplus, despite falling oil prices. And that he isn’t really worried about oil prices tanking. The next moment he’s proroguing the budget!!! Finance Minister Joe Oliver says he will delay the federal budget until at least April due to the volatility of the economy. 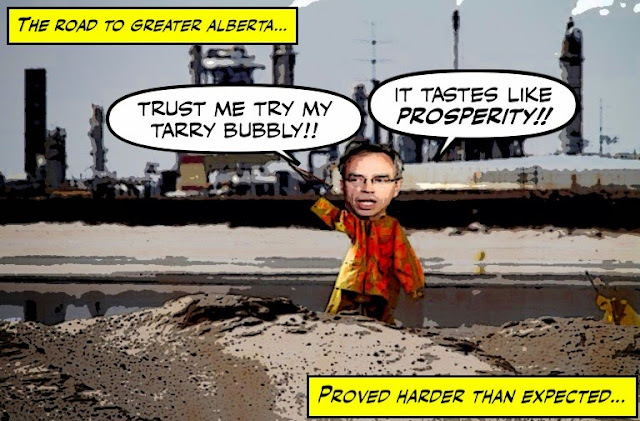 Oliver said the sharp drop in oil prices is having a complex impact on the country’s economy. And he can’t even tell the difference between Yogi Bear and Yogi Berra!!! 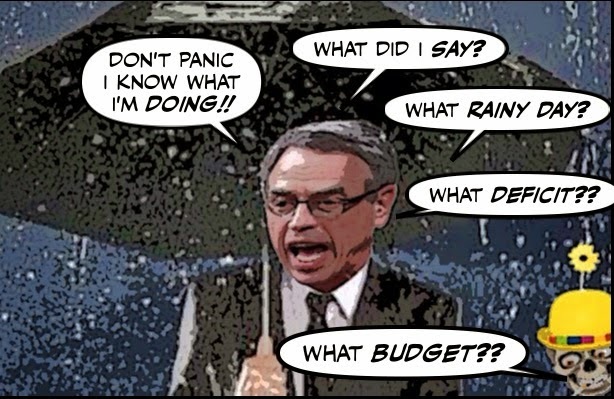 While announcing the budget will be delayed until at least April, Joe Oliver attempted to make a joke about how often he is asked for a specific date and how often he can’t respond. 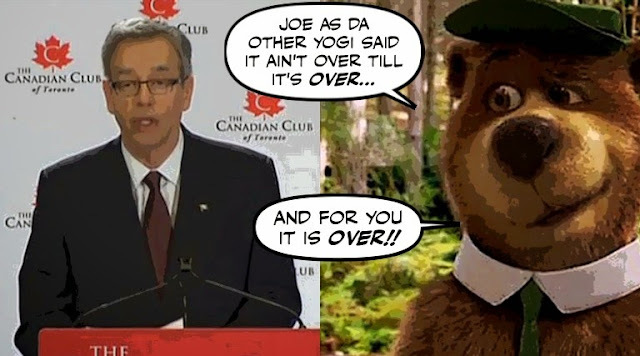 He quoted ‘the great Yogi Bear’ as saying he wished he had an answer because he’s tired of answering that question. That’s actually a quip by Yogi Berra, the legendary New York Yankees catcher known for his witticisms — and not from the bumbling Hanna-Barbera cartoon character with his sidekick Boo Boo. OMG. And he’s the Finance Minister? Joe, Joe, say it ain’t so. Tell me you haven’t lost the budget AND your marbles. Oh well. One thing is still true eh? Oliver and his sidekick Boo Boo.